A catamaran made out of 30,000 cans has set sail in Darwin, Australia, much to the astonishment of onlookers. 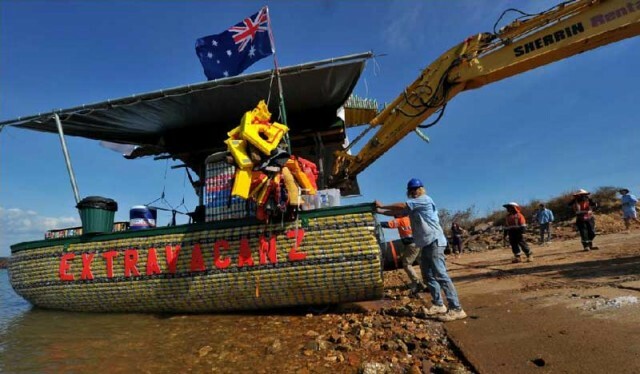 The 2.5-ton boat, named Extravacanz, was launched at Dinah Beach, Darwin, and made an impression with onlookers, who were stunned to see it float. Since the boat set sail on its maiden voyage it has appeared at the 2012 Beer Can Regatta at Mindil Beach and attracted hundreds of onlookers. Skipper Mick Keely joked he was never worried about whether the catamaran would float before admitting it was a ”big relief”.